Towards east of Darjeeling(35 km from Darjeeling, 52 km from Siliguri), through Ghoom-Jorebunglow, one passes through lovely scenic spots and lush green tea gardens. 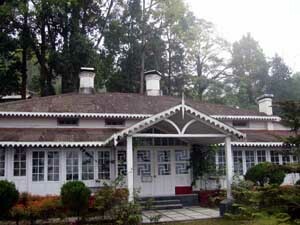 Flower nurseries and crystal clear rivulets cross your way in journey towards Mungpoo, famous not only as a summer residence of poet Rabindra Nath Tagore, but also famous for Cinchona plantation. The great poet and superman kabi Guru Rabindranath Tagore, universally reverend of celestial appearance and endorsed with supernatural genius, whose coming has hallowed this planet-first kept his foot at Mungpoo in the invitation of his disciple Mrs. Maytree Devi wife of Dr. M.M.Sen, of the then Quinologist, to the Govt.of West Bengal, of Govt. Quinine Factory in 1938. That year he came over to Mungpoo from Kalimpong on the 21st of May and stayed here at Mungpoo in the Bungalow of Dr. Sen till the 9th of June.In 1939, he came for the second time on 14th of May and went back on 27th June. The same year in autumn from 12th Sept. to the first week of November, he stayed as an honoured guest of Dr. Sen for the third time. In 1940, he came for the 4th time on 21st April and his birthday on 25th Baisak was celebrated here with the local hillmen. The day, he composed three poems called‘BIRTHDAY’. While staying at Mungpoo numerous poems, articles, letters and story and painting have been composed. Many a time in the Bunglow, he stayed resounded with his sublime and joyful voice in rhyme, songs and recitations. Here in this place, which has been sanctified by the coming of Rabindranath.The Bungalow where Kabiguru stayed is being maintained now as Museum with his photograph, painting, writings etc. Read the historical relation of Kabi Guru Rabindranath Tagore his Museum and Mungpoo.